Direct Supply, Inc. is one of the top shrink film suppliers in the Chicago area! We offer shrink film from top brands to secure and protect your products. Our team can help you select the best heat shrink wrap to meet your company’s needs. Contact us today to find out more. How Is Shrink Film Different From Stretch Wrap? At the most basic level, stretch wrap “stretches,” whereas shrink wrap plastic film “shrinks” and does not stretch much when pulled. This means that the two plastics feel quite different when comparing them side by side, even though they may both look similar when looking at two rolls of them sitting side-by-side. Shrink film is often used to protect or wrap a single product, like the wrap you find around a wall calendar. It can also be used to tightly bundle a set of products together, like a single pack of drinking water bottles. The wrap is placed loosely around the product or bundle of products using one of several application methods (film rolls, tubing, or bags). When heat is applied either by heat gun or by heat tunnel, the shrink wrap shrinks to perfectly envelop the product(s), while still allowing a very clear view of the contents within. 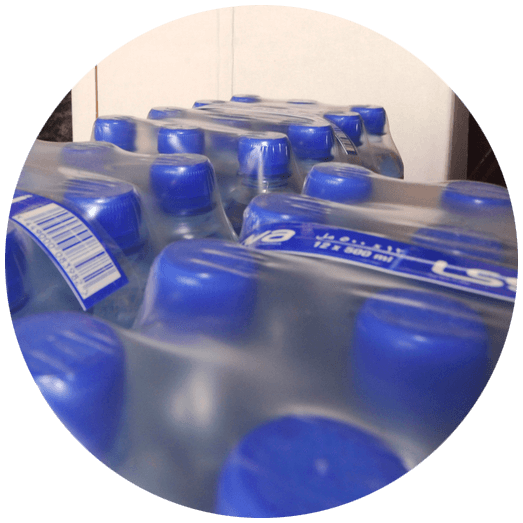 If you think about the water bottle example again, stretch film could be used to securely hold a pallet full of water bottle boxes together, securing the load and even affixing it to the pallet. Stretch film can be applied by hand or machine and does not require any heat application methods. Yes, the two products – stretch and shrink film – can even be used on the same pallet load! When it comes to choosing a film type, there are three main materials to choose from: PVC, polyolefin (POF), and polyethylene (PE). Which one should you choose? Cross-linked POF shrink film (POF that has gone through an irradiation process) gives an even stronger option for some packaging needs, while also being FDA-approved for food contact. POF is especially good for heavy products due to its tensile strength, as well as products with sharp edges. The downside of Polyolefin shrink film and irradiated POF? It’s usually more expensive than PVC and Polyethylene alternatives. PVC stands for “polyvinyl chloride,” and was the most commonly used type of heat shrink film material until POF was discovered. It’s used mainly for wrapping single objects, like a DVD case. PVC is a more affordable option when compared to POF films, but it does come with some caveats. Not as good as POF at bundling multiple products together (like the water bottle carton example) due to it’s more brittle composition after shrinking. Not as temperature-resistant to cold and hot temps. PVC film tends to become more brittle in the cold, and more flexible or soft in hot weather. Sealing by-products or off-gassing. PVC requires your packaging area to be well-ventilated. Polyethylene films are actually a kind of POF film that have had an addition of ethylene during the manufacturing process. You probably wouldn’t want to use PE to wrap one-off consumer products, as it’s shrink capabilities are less than both POF and PVC and its clarity isn’t as good. Sometimes PE wrap is even intentionally opaque! However, polyethylene shrink film can be used when SUPER holding strength is required, like when you shrink wrap a boat for winter storage, or when shrink wrapping pallets in shrink wrap bags for transport. To put this in perspective, PVC and POF come in gauge thicknesses of around 100, whereas PE gauge can go up to 1200! This also allows businesses to print branding or cargo identifying information right onto the PE film before it is shrunken onto a package. Here’s a short list of some of the shrink film brands Direct Supply offers. Contact us to see if we have your favorite brand in stock! At AEP, we are serious about innovation and packaging solutions. The results achieved by a dedicated team of Product Development, Quality Control, and Research and Development allow us to tailor the correct film for your application and specific needs from our family of Shrink Bundle Films. Polylactic Acid (PLA) is an ecofriendly bioplastic made from renewable resources which is becoming more and more popular thanks to its biodegradability, biocompatibility and good thermomechanical properties. The PLA shrink film behaves similarly to other films while it requires a lower amount of heat to shrink and presents an higher maximum shrinkage ratio. Our patented Cryovac® Technology micro-layered shrink films offer superior shrink, strength and merchandising appeal, as well as source reduction that does not compromise performance.